Welcome to day three of our Bible Study Tips series. Today I want to encourage you to make God’s Word your life’s workbook. There is no more excellent workbook for wisdom, guidance, comfort and so much more! 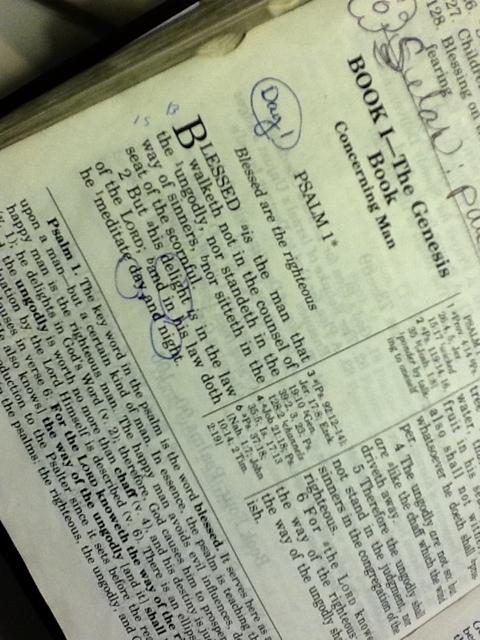 I have some simple tips that can be a big help as you delve into the Bible. I like to place the small removable sticky notes in my Bible to mark specific places I refer to often. I have used the basic colored paper types, but it doesn’t take long before they get smashed and don’t look very nice. 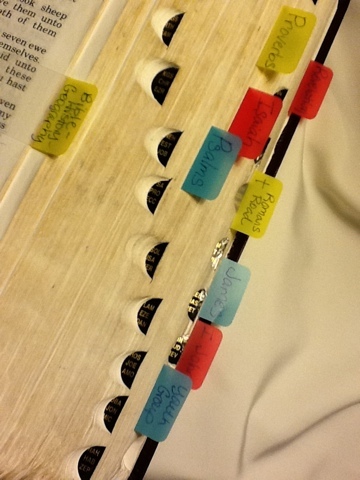 So now I use removable, reusable sticky tabs as shown on my Bible in the photo above. You may be thinking, “what in the world do you need all those tabs for”? I’ll explain how I use the tabs and then you obviously you will want to adapt it to your personal needs. I am a homeschool teaching mom so the first yellow tab is where we are currently reading in our school time. The first blue tab is for the Psalms. I like to read one or more Psalms a day. Since there are 150 of them, you could read 5 each day and read through all of Psalms every month. Its been a quite awhile since I’ve read all of Psalms through in a month, but I love to read at least one a day. The next one is yellow again and it is marked Proverbs. There are 31 Proverbs, one for every day of the month. My grandmother taught me this method of reading through the Psalms and Proverbs monthly. I think at 85 years young she still does this every morning! The next tab I have is for Isaiah. I just wanted to read through this wonderful book, because I never have. The next tab you see is blue again and it says, “Youth Group”. Jeff and I are teen leaders and right now our Youth Pastor is teaching in the book of John. Since it is marked, on Sunday nights I can quickly find my place and be ready to go. Next, I have a yellow tab that reads, “Romans Road”. I can flip right to the first verse in the Romans Road when sharing the Gospel with someone. Then I have James marked because that is what we are studying in Sunday School at the time of this writing. Then, the last red tab is marked, First John. This is for my *Good Morning Girls I John Bible study in my Quiet Time. *You may have noticed the worksheets in my Bible Study Notebook. This came from http://goodmorninggirls.org which is the sister site of http://womenlivingwell.org. The Good Morning Girls do a 12 week Bible study on a particular book of the Bible. We are currently halfway through I John. You may join an online study group or do the study independently. I am doing this one independently. 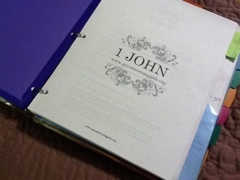 Courtney and Angela also offer free downloads of the Bible study sheets (using the S.O.A.P. 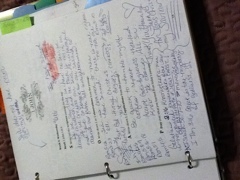 Method) for the book we are studying. Check out the Good Morning Girls blog to learn more! I love it! I have really been blessed by the Bible study. What a great “system” I love it. Thank you for sharing these tips. In all my years of studying God’s Word, I have never had such an organized system….I am going to start my own notebook and tab systme. Thank you sweet heart. Proof – a mother can learn so much from her daughter ….. I love you. Thanks Mom! It’s a pleasure to share these tips! After you left a comment on my blog, I decided to check yours out and I have to tell you that I have been very blessed. I am always looking for new ways to read/study my Bible and you have presented some great ones. Thanks for sharing!